Genelec introduces Smart Active Monitor desktop speakers | What Hi-Fi? Despite having all the pro credibility it needs, Genelec's new Smart Active Monitor is tailor-made for the home. 8430A isn't the snappiest name for a product and neither, let's face it, is Smart Active Monitor. SAM is much friendlier handle, and it indicates just how accomplished Finnish pro-audio stalwart Genelec is getting at having its cake and eating it. In terms of its broad specification, SAM is a thoroughly thought-out pro tool. It's an active-over-IP design with a claimed frequency range of 45Hz to 23kHz. It's fitted with AutoCal acoustic room measurement. Inputs begin and end with an analogue XLR socket. And yet. Dimensions of 30x19x18cm (hwd) are desktop-friendly. A 13cm mid/bass driver with 19mm metal dome tweeter above is equally domestically acceptable, as it 50 watts of power to each driver. And Genelec is showing SAM not as part of its little ISE 2016 studio but as the entirety of a desktop system. Just add a computer. 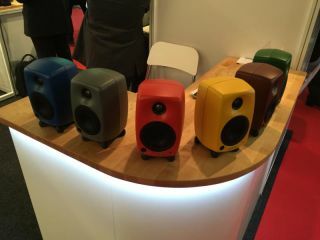 Admittedly, at €800 per speaker (excluding VAT) SAM isn't exactly the most easy-going in terms of price. But just wait a while. As soon as SAM becomes available in the rather sudden new range of colours the G-series is being shown in, we'll know for sure.